It was a pefect Sunday morning for a food blogger brunch bash sponsored by YP celebrating #makeeverydaylocal. The locale — one of the most talked about restaurants in Atlanta — Empire State South. Ah the benefits of being a food blogger! The entrance to Chef Hugh Acheson’s Empire State South, in mid town Atlanta, is through a a court yard nestled between office buildings. The city green space is a wonderful surprise and sets the mood as you walk to the restaurant. This was to be the first of many surprises. Entering Empire State South you find yourself in an environment of dark woods and high ceilings that give both a cozy and spacious feel. I was greeted by server extraordinaire Joseph who suggested I sip on the house Bloody Mary while chatting and networked with some of Atlanta’s most in-the-food-know bloggers. 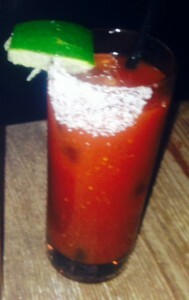 The Bloody Mary was delicious with bit of a back of the throat heat that was definately not unpleasant. No traditional celery here. Surprise .. the green veggie was a bean .. yup a bean that was hot and spicey. 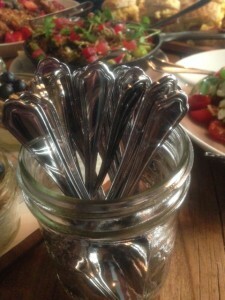 Joseph was right — the perfect way to start the blogger brunch bash! Of course a brunch is all about food, friends and good cheer. Check Friends. ✓ Check Cheer. 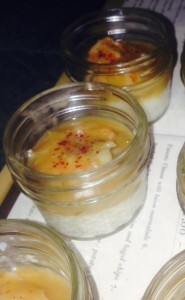 ✓ Chef Acheson treated us to a beautful variety of dishes. 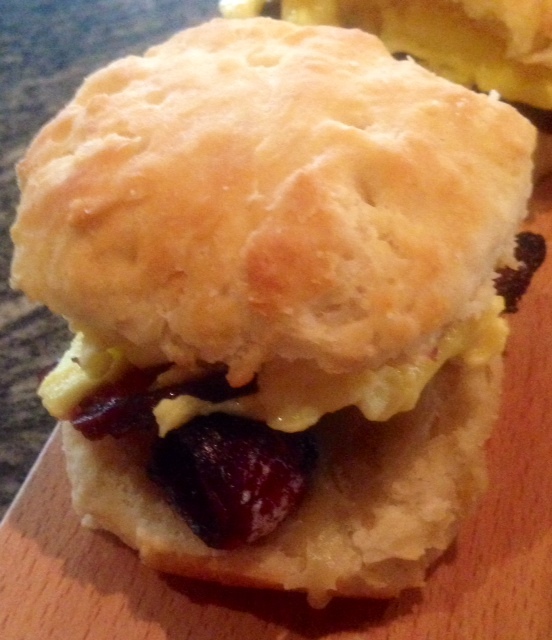 One of my favs was the biscuits with either ham or bacon. The biscuits were so flakey and rich. More surprises … melted cheese which added a creaminess to the bite. Satisfied and happy the bloggers were ready for their next surprise — in walked Chef Hugh Acheson. Erica Key, our host from YP, introduced the owner and vsionary chef. If you haven’t had the pleasure of meeting the talented Chef Hugh, he is witty with a sense of humor as dry as the best top shelf martini. He graciously answered our questions. On social media. It’s a quick and easy outlet for marketing effectiveness. However, his own social networks are more about his life and food experiences not usually about the restaurants he owns. On staff and customers. A restaurateur has to deliver as much to staff as to customers. On success. 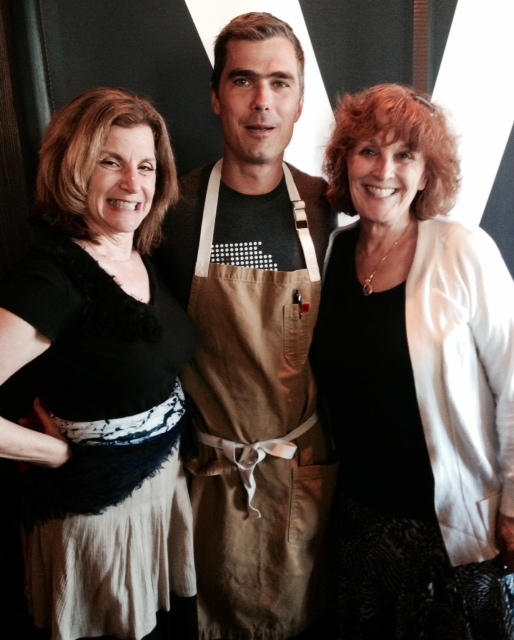 A true celebrity chef celebrates his community and is celebrated by his community. and posed for the obligatory photos. As we said our good byes, I ended a wonderful morning with the ultimate coffee … a brown sugar latte. Rich, slightly acid and totally indulgent. Leaving Empire State South there was one more surprise waiting for us .. an autograph copy of Chef Hugh Acheson’s new book, The Broad Fork. …. and there is an extra surprise for for you and us too! 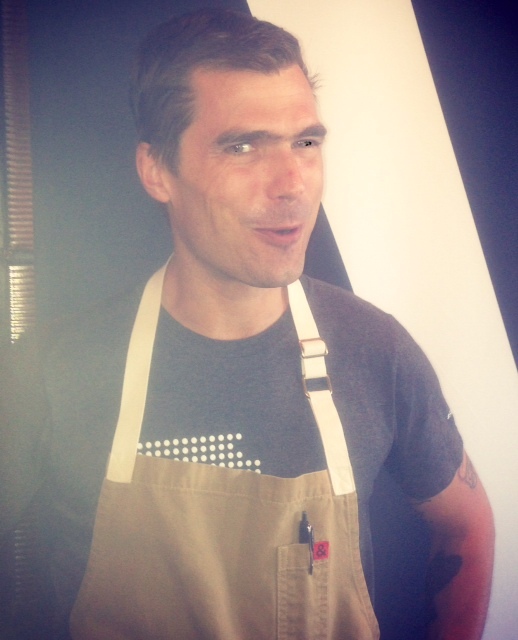 Chef Hugh Acheson agreed to be a guest host on Diva Foodies tweet chat #FoodTVChat. 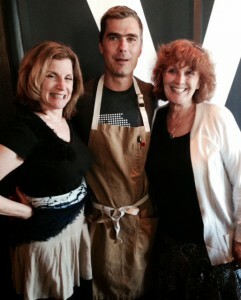 Chef competed in Bravo’s Top Chef Masters, Season 3; he’s a judge on Top Chef. More up dates soon! 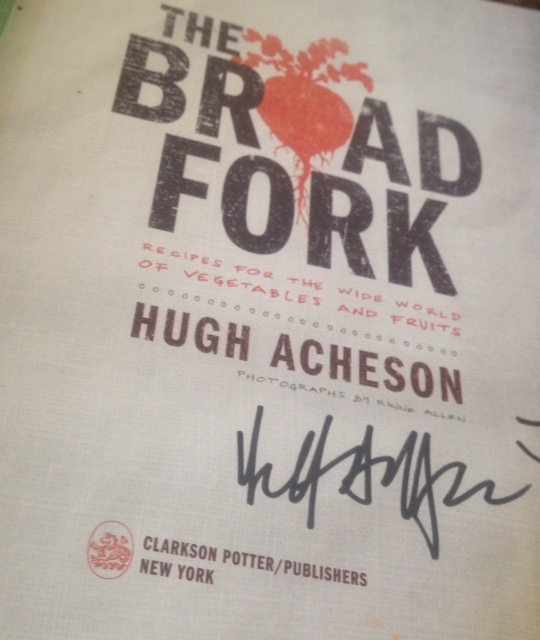 Disclaimer – we received a complementary copy of the The Broad Fork and the meal was also complentary; however, all opinions are those of the author of the post.